Summer is here, and that means that it is time to pay extra attention to your lawn to keep it healthy and beautiful all season long. A sprinkler system is a great way to help keep your lawn green and healthy all summer long. The summer sun can really dry out your lawn, and learning how to properly utilize your sprinkler system can help keep your grass beautiful. Before using your sprinkler system, be sure to check with your town to find out how often to water. Many towns have water bans or do not allow watering between specific hours. To be safe, always check with your town to avoid fines. Also keep in mind that watering your lawn during the daytime can cause much of the water to evaporate into the air. Watering in the early morning or evening is best. 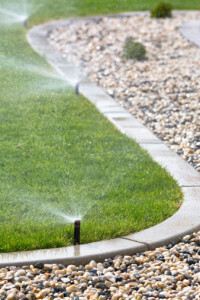 Establishing a sprinkler watering schedule can help you save water and keep your yard healthy. Consult your sprinkler installers or your local landscaping company for more on how to make the most of your sprinkler system. Most lawns only need about ¾ inch of water per session. An easy way to determine if your lawn is getting enough water is to place a few empty tuna cans evenly around your yard, and let your sprinkler system run for 30 minutes. 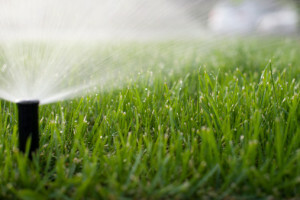 After the watering session is done, check the cans to make sure that each section of your lawn is getting enough water. If there is too much or too little water in the cans, adjust the time accordingly. After determining how long your sprinkler system needs to run in each session, calibrate your sprinkler system to turn on and off when necessary. This will allow the system to water your lawn even if you are not home. Apart from watering your lawn, there are other ways to make sure that your yard and the plants within it stay healthy and beautiful. Rainwater– Don’t water your lawn on days that it rains. To make the most of the rainwater, turn the downspouts from your gutters toward the plants in your yard. Mulch– Using mulch on your garden beds not only helps prevent weeds, but is also a great way to help keep your garden soil moist. Perfect for retaining water on those hot days! Healthy Roots– Mowing your grass to short is not good for your lawn. Longer grass means that the roots of the plant are longer, stronger, and healthier. A strong root system helps the grass feed on water and nutrients in the soil. When your grass is too short, the plant puts more energy into growing new leaf blades than establishing a strong root system. If you are passionate about gardening, or if you simply want to have a beautiful lawn, a sprinkler system may be right for you. The landscape professionals at Greener Horizon in Middleboro, MA can assist you with irrigation design, installation, and maintenance. Take the first step to achieving a beautiful lawn by contacting us today!